I did it guys, I got my eyebrows microbladed and I want to share my FULL experience with you all! I got mine done at The Brow Studio in Calgary by brow artist Dayna. Cosmetic tattooing aka semi-permanent makeup/micro pigmentation/borw embroidery is the process of implanting color pigment beneath the surface of the skin through needles to create the appearance of hair strokes. 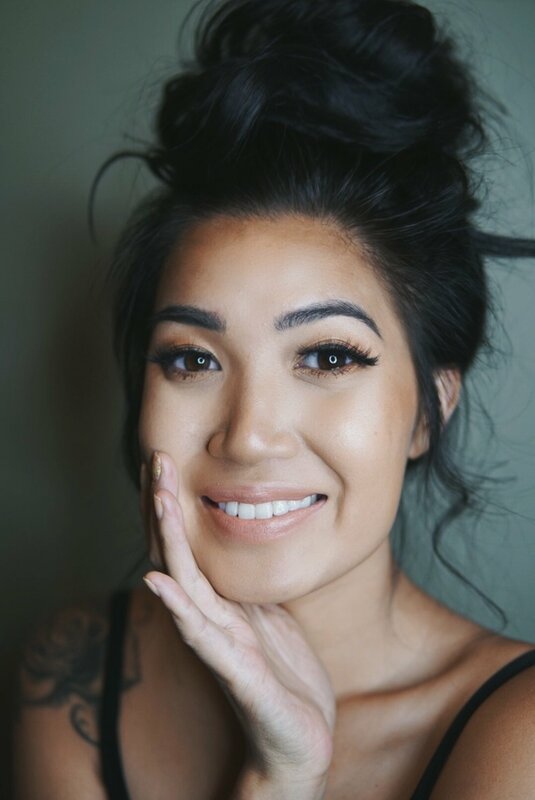 Unlike traditional body tattooing, microblading is more soft and subtle because the pigment is only deposited into the first 2 dermal layers of the skin that will naturally fade over time. To start, I already had full eyebrows in a fairly dark brown. My issue was the front of my brow hairs were very light-colored brown and my tail length was not as long as I liked. I have had a good shape since about high school (post over plucking, skinny stick eyebrows! Thank god that phase ended quickly) so my desired shape was simple, I just needed to fill in the front and give me some length. My makeup process on a day to day basis is fairly quick and only takes me about 15-20 minutes with the vast majority of this time dedicated to my brows. So, I was more than okay to cut down that time and eliminate the brow process. Pictured here are my brows post 2nd microblading session with no brow make-up! Don't they look so natural? First, I came in and met my brow artist, Dayna, who sat me down and went over a 30-minute consultation. During the consultation, we went over my 'brow goals'. The purpose of this was to develop a shape that I would love. Next, we went over the pigment options and color that would go best with my skin tone. Before the tattooing started, she applied a topical anesthetic (5% lidocaine cream) to numb the areas 30 minutes prior to the procedure. Dayna used a hand-held tool to implant the chosen pigment colors into the dermal layers to enhance my brow hairs within the brow designs. When she finished, a pigment mask was applied to my brows for 10 minutes to penetrate through the lymph system. The whole process took about 2 and a half hours. Yes! The numbing cream did help the beginning parts of the process and it was reapplied during but for me, the procedure did hurt. Immediately after, I had some redness and swelling. It took a few days to go down then my brows began to scab and peel. After this, my brow color faded quite a bit but the faint shape was still there. Two months following my first session, I came back for the mandatory second session which helped deposit the color long term. I'm 3 weeks post second session and my brows seem to be fully healed. The color has faded so the microblading looks very natural. Most days I don't fill in my eyebrows anymore, but on weekends or shoot days, I do fill them in for a more dramatic brow. I would absolutely recommend it! Aside from a few of my girlfriend who have the most perfect, full, dark eyebrows, I think we could all use a little fill in. This makes the tedious process of filling in so much easier. If you're anything like me, I spend extra time on my eyebrows because I want them to look natural as possible and I can never get both brows to match. One always looks flawless and the other a little sad. Microblading saves so much time and is perfect for the summer when my skin is tanned and my eyebrows are already done, I get to just wake up, moisturize and go outside to live my best life! I was told that depending on the aftercare, this will last 1-3 years and I can touch up every year. I highly suggest it! Let me know about your experiences babes!